The Muppets Movie Review: Fine for Kids, but Will They Care? The Muppets have always been grown-up versions of the “Sesame Street” characters. If you were a little kid in the late 1970s, you probably have fond memories of watching their variety show. I watched it with my grandfather, listening to him chuckle over the antics of Kermit, Fozzie and the rest. Fast-forward 30 years and a handful of theatrical films later. Most kids know Elmo, but how meaningful is a visit back to Muppet Studios? “The Muppets,” the latest film excursion for this band of felt characters, catches us up years after Muppet fame has peaked — and crashed. 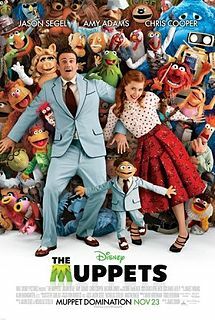 Human character Gary (Jason Segel) is best friends with Walter, who happens to be a puppet. Since childhood, Walter has dreamed of being a real Muppet, so when the friends have a chance to visit Muppet Studios, they jump on it — and are horrified to discover that the studio is run-down and the Muppets disbanded. Tex Richman, an “evil oil baron,” plans to raze the studio. From there, the friends (along with Gary’s long-time girlfriend Mary, played by Amy Adams), scheme to get the gang back together, put on a show and raise money to get the studio back and make the Muppets famous again. But that’s like saying that Pixar’s “Up” is about a boy rescuing a bird from a hunter. But it’s serious, too. Emotionally, the movie aims for a level of sophistication that’s above the average 6-year-old. The puppet characters are filled with regrets. A scene where Kermit and Miss Piggy discussed how they disappointed each other could have just as easily played out with, say, Johnny Depp and Penelope Cruz. Time has passed since their hey-day, and we’re asked if the Muppets were left behind. Tex tells them, “You’re relics, Muppets. The world has moved on, and no one cares about your goody-goody, hippy-dippy Julie Andrews and Dom DeLuise hostin’, singin’-and-dancin’ act anymore. You’re dead!” For those who wouldn’t recognize Dom DeLuise, sadly, that may be true. Muppets Good to Show Your Children? So, should you even try to get your little ones to watch? If you want to share the Muppets with your kids, it’s sure worth a try — it’s a kid-safe experience. The language is squeaky-clean. I’ve heard some take offense at the “evil oilman,” but along with the soundtrack, Tex is a throwback to the 1980s. Gary and Mary share a hotel room on their vacation, though the twin beds are obvious and their relationship is almost painfully wholesome. “The Muppets” is a great film for older kids who like sllly humor (and who doesn’t?) and may be able to grasp how friends can get left behind. Be warned, though — it packs a surprising emotional punch. If you were embarrassed when your daughter or son caught you crying at the beginning of “Up,” you might want to prepare yourself. At least on home video, you can slip out of the room for a moment. I haven’t seen it, but I have heard good reviews about this movie. Though the note above about Gary & Mary sharing a hotel room bothers me. If it’s a kids movie, why not just have them be in different rooms? However, considering how unclean so many movies are these days, it is refreshing to see a movie that seems to pass all the filters with flying colors. Jennifer Rose Hale is a freelance writer and web producer at an education nonprofit that offers online education opportunities and discussion for a variety of age groups. This Muppets movie looks actually interesting by just looking at their poster but I am not sure of kids would love this as well.. Just looks exciting for me.. I didnt know Segel was in this, I guess that explains the monologue from the Saturday Night Live episode he hosted this season. I might catch this in theaters, might not, since a lot of big ‘blockbusters’ are still to come this summer. Exciting times! The Muppers was such a fun movie.